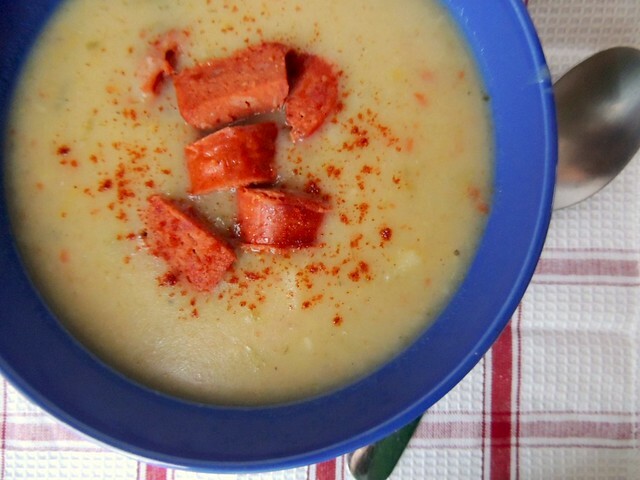 This potato soup is a "recipe" I've made a few times during the colder months. By recipe, I mean that I added ingredients until it looked right and had the consistency I was after. Eventually, I wrote an actual recipe out so that I could post it here. Potato soup is my favorite cold weather soup of all time. It's starchy, thick, and comforting. My mom used to make a baked potato cheeseburger soup that I was my first potato soup love. For this soup, I was inspired by a potato soup from Once Upon A Tart I tried a long, long time ago. Their soup featured Yukon gold potatoes pureed with roasted garlic, and even though it was 80° the day I tried it, it was so memorable. You can add roasted garlic to this soup, which I did once, but I didn't include that step so as to make it easier. What I love about this recipe is how easy and quick it is to make. 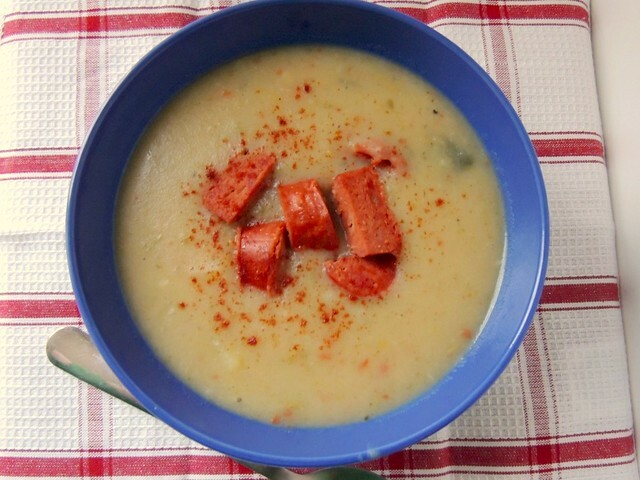 Unlike many traditional potato soups, this one doesn't contain much milk. You could probably leave it out, if you really wanted to, though it adds a creaminess that chicken broth alone doesn't provide. 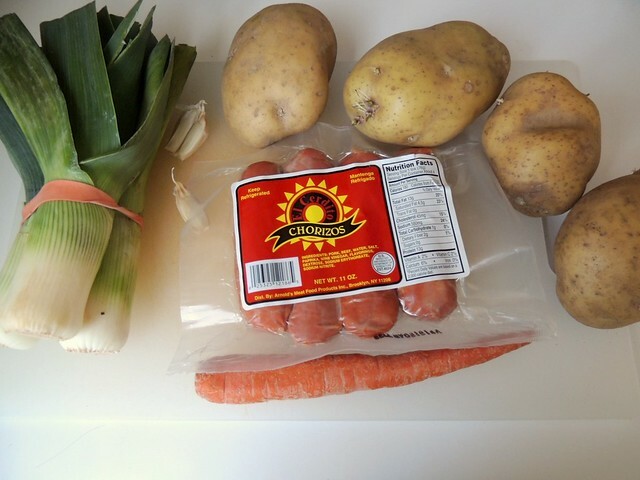 The ingredient list is simple - Yukon gold potatoes (my favorite kind of potato), leeks, garlic, carrots, and chorizo. First, the chorizo is chopped and sauteed in a dutch oven. Cooking the chorizo first gives the soup more flavor, since it's not cooked with the soup. If I'm not using chorizo, I add bacon grease. Or not, if you're vegetarianizing the recipe. Next, the leeks, carrot, and garlic are sauteed for a couple of minutes. 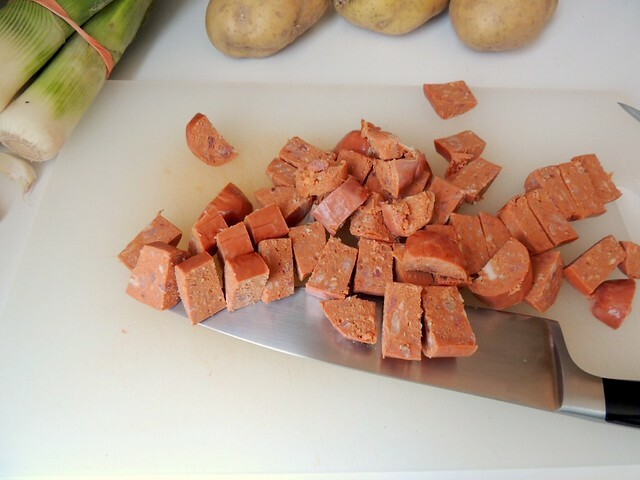 The potatoes are chopped into a large dice so that it cooks quickly and is easier to puree. 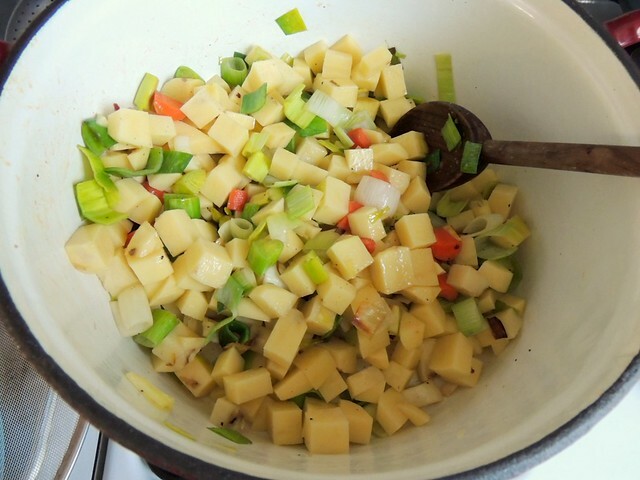 Add the potatoes to the leeks and saute a few more minutes. Chicken broth is poured on top, brought to a boil, and reduced to a simmer. It takes about 25-30 minutes for the potatoes to cook. To puree the soup, the easiest way is to use an immersion blender; if you don't have one, a food processor or blender will work. If you want to leave it a little chunky, remove a cup or two of the potatoes before blending. Pro tip: You probably shouldn't use an immersion blender in a ceramic-enameled dutch oven. After pureeing the soup, warm milk is stirred. Besides the creamy consistency, it also smooths out the flavors. Pro tip: I've seen soup recipes that add the milk before pureeing. DO NOT DO THIS, or you'll end up with a soup latte - soup topped with milk foam. Top each bowl with some chorizo and paprika and you've got dinner! 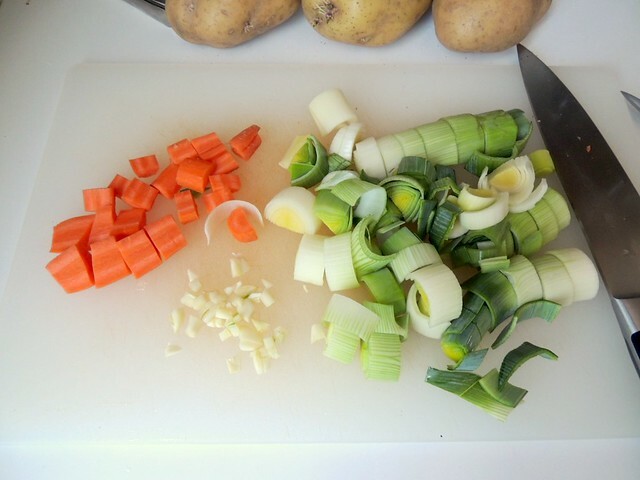 I love this soup so much, I think I'm going to make it tonight, maybe with some cheese. Alongside Irish soda bread. It's such a great basic recipe you can easily modify by using different ingredients. Leftovers (if there are any) might need to be thinned with additional liquid, since it thickens considerably when refrigerated. If you make this recipe, let me know how you liked it and if you have any comments about the recipe. Post any modifications you make, too! Pour chicken broth over top and add bay leaf to pot. Bring to a boil, then reduce heat to maintain a rapid simmer. Cover. 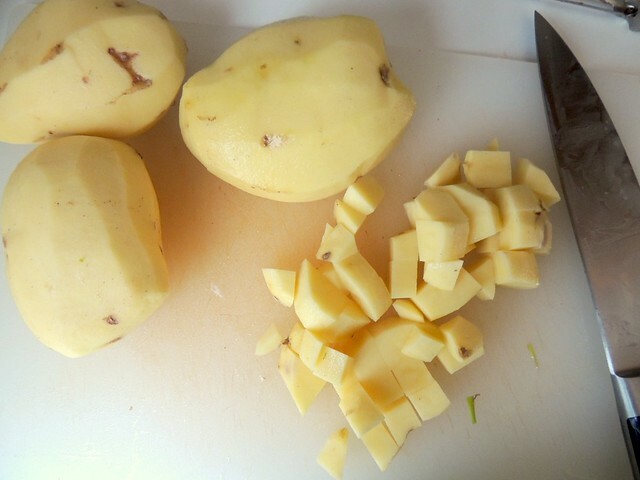 Cook, stirring occasionally, for 25-30 minutes or until potatoes can be easily pierced with fork. Reduce heat to low. 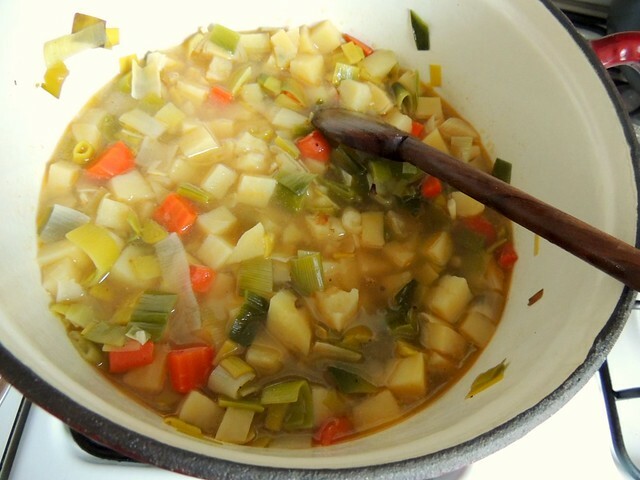 Remove up to two cups of potatoes if you want a chunkier soup. Puree potato mixture with an immersion blender until completely pureed. Pour in warmed milk, stirring to combine. Check seasonings and adjust if necessary. Divide soup between bowls. Top with chorizo and a sprinkle of paprika. I love all things chorizo right now so this sounds fab to me! This sounds right up my alley! Bookmarking! !